Two years ago, the vision of a few people became the reality of many. 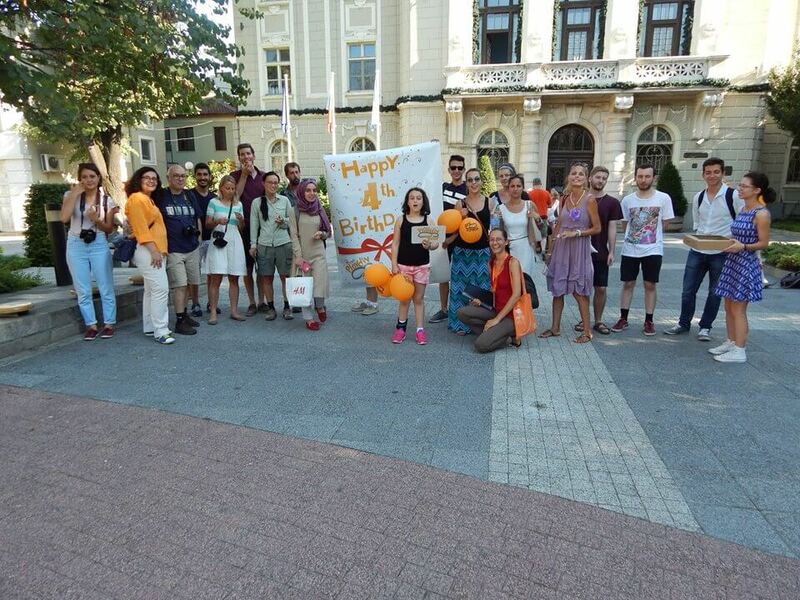 A new project was born that was to become the free tour of Plovdiv. Since then, Free Plovdiv Tour has been introducing the city of Plovdiv to the world. In these two years, we have welcomed more than 4,700 people. Our team of enthusiastic guides have met, walked with, explained to, inspired, and made laugh these 4,700 travellers. But mostly, we have provided an insight into Plovdiv and its cultural heritage. 1,400 hours or 84,000 minutes of fun and interactive sightseeing have been delivered to our tourists. As all our guests know, there is a tour every single day of the year. Whether it’s cloudy, raining, snowing, shining – or if the weather is doing all of these at the same time (:D), the guide with the Free Plovdiv Tour sign will be there and you can expect nothing short of two hours of fun and engaging infotainment (a very special mix of information + entertainment). To give you a small tease of how it will go, you can check out the pictures from our birthday last year. Please see our facebook event and tell us if you’re coming!